Feature: The (Sadly Fictional) Super Smash Bros. for Nintendo Switch Fighter Ballot - Results! Back in May we launched our very own “fighter ballot” to hopefully gain some excitement for the possible E3 announcement of Super Smash Bros. for Nintendo Switch. Unless you completely missed all-things E3 2017, you'll know that this sadly never happened. Punching in at the number five spot is a candidate that this writer would consider an interesting choice to include into the Smash Bros. roster. 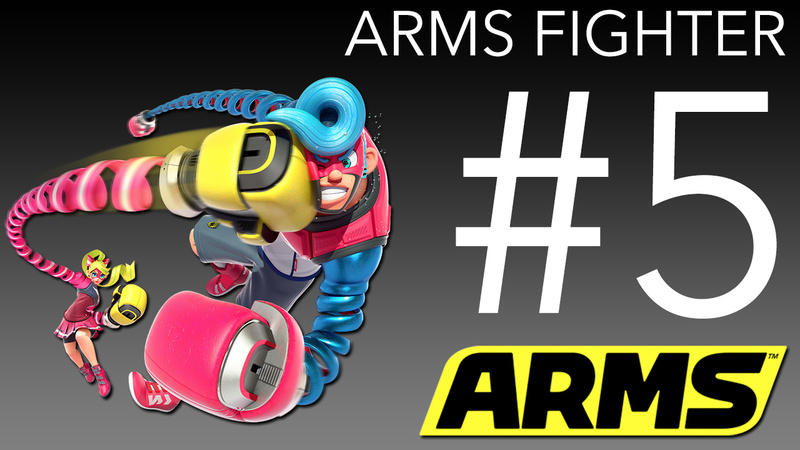 With the very recent launch of ARMS, and many getting to play Nintendo’s new fighting IP via Global Testpunches and/or review events, the spike of interest in these springy stars comes as no surprise. The immediate and unique trait that the whacky cast of ARMS possess – that being their extendable arms – could prove to be an excellent mechanic for the Smash dev team to play around with, truly making them a distinctive character (much like how Street Fighter’s Ryu brought the mechanics of his respective fighting game into the fray). As for the ARMS folks' patented rush special, that could either be the character’s Final Smash, or maybe even an extra special move that requires a gauge to fill (akin to the game), such as that of Little Mac and Cloud Strife. Though unlikely, if the big N really wanted to go all-out, perhaps it could make each skin palette as a different ARMS fighter, each owning a unique mechanic – such as Min Min being able to spin-kick while air-dodging, or Master Mummy needing to take several hits before flinching/being knocked down. The likelier option, of course, would be only choosing one fighter from the new series, and the probable pick seems to lean towards the unofficial mascot, Spring Man – although maybe they could tinker with someone like Ribbon Girl as an alternative costume (with the same mechanics) as the two are of similar size and stature. Whether this proves to be a smart move by Nintendo due to raising further awareness of ARMS, or backfiring due to potentially cannibalising this new first-party fighting IP by including a character from this game in Smash Bros. - the crème de la crème of Nintendo fighting games - remains to be seen. The latter is unlikely, since we now know that Smash for Switch, port or sequel, won't be coming anytime soon. 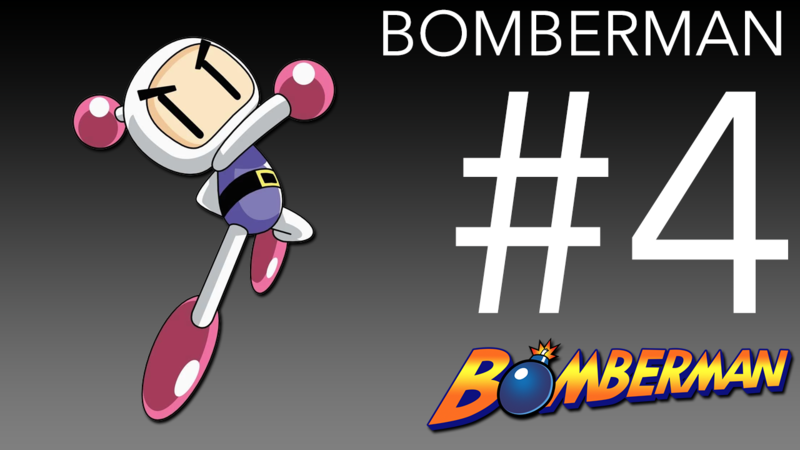 Blasting through in fourth place is Konami's Bomberman, a legendary video game character and franchise that arguably belongs in the same breath as Smash 4's other third-party stars such as Pac-Man, Mega Man, and Sonic the Hedgehog. Right from the bat, it's easy to scope the mechanic of what Mr Bomb's moveset would revolve around, that being his ability to plant a bomb followed by a kick or a throw of the explosive. The devs could think of a clever way to implement the power-ups within the series into Bomberman's specials, such as being able to plant multiple bombs in quick succession or increase their explosive range. Maybe this is done with a chargeable gauge, or something akin to Shulk's Monado Arts that allows the player to choose the buff they receive to their bombs. 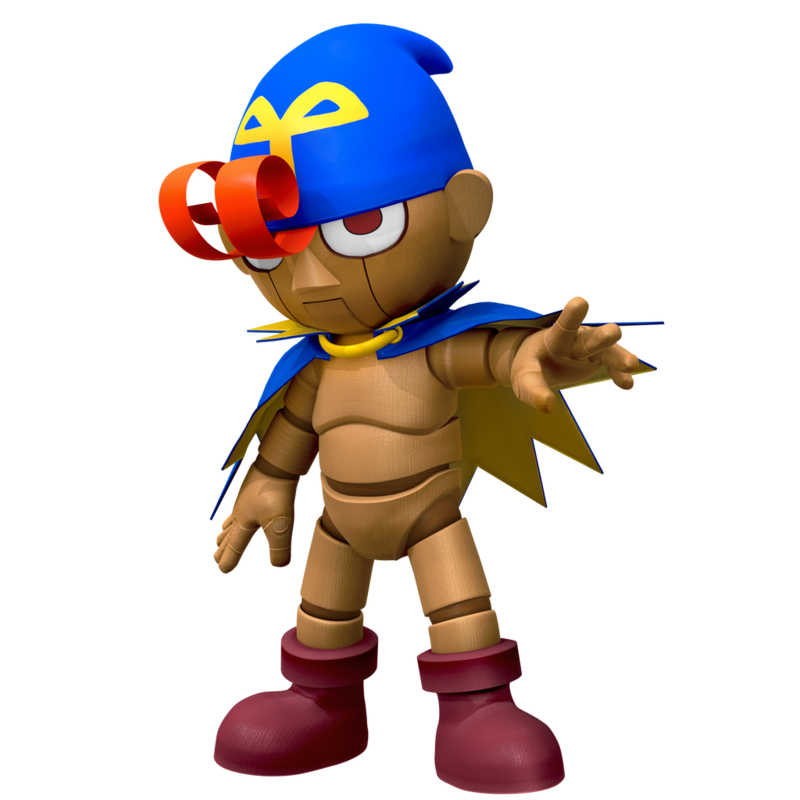 Alternative outfits could be the different bombers as presented in Super Bomberman R, with their voices changing respective of the type of bomber chosen. If not, the differently-coloured Bombermen in past Bomberman games would suffice at the very least! 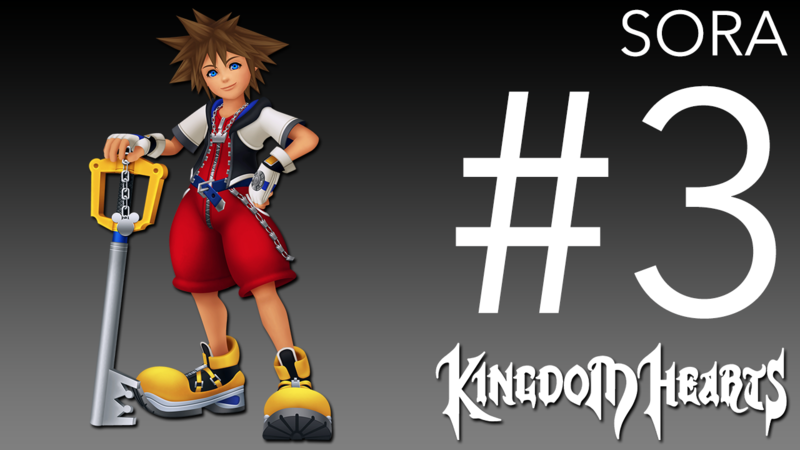 Soaring-in (sorry) at number three is Disney’s Sora, the main protagonist of Square Enix’s Kingdom Hearts series. The immediate thought of such a fighter would be the use of magic from his Keyblade, allowing a mixture of physical, special, and projectile attacks. However, as Sora has such a diverse pool of abilities across his illustrious franchise, it could prove to be difficult to pin down a moveset that captures his essence entirely. Perhaps one or more of the supporting cast – such as Mickey Mouse, Donald Duck, or Goofy – could play a part in his moveset, or maybe even his Final Smash (Trinity Limit)? Like Cloud, Sora could rock the different outfits and/or forms encountered throughout the Kingdom Hearts games, such as his default in-game attires, to his Valor, Wisdom, Limit, Master, Final, and Anti forms. Digging his way through to second is Shovel Knight. Smash Bros. accommodating a character such as this would be something quite revolutionary, for the idea of an indie-game character joining the battle in one of Nintendo’s biggest franchises is something never seen before. 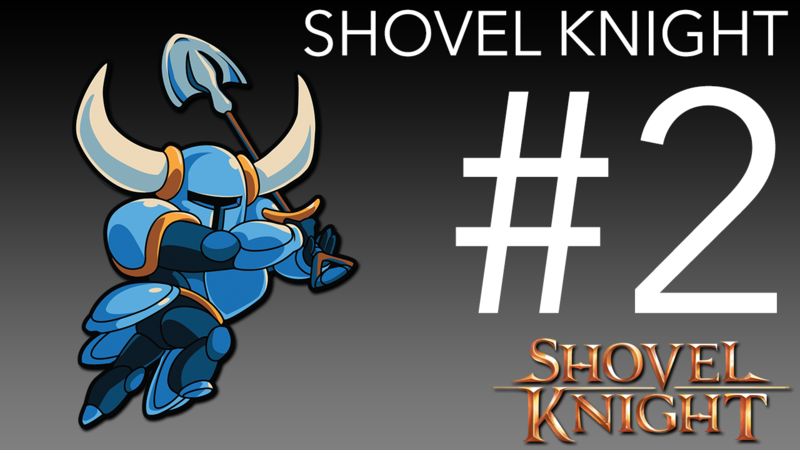 With the use of his Shovel Blade, Shovel Knight could use a combination of swings, spins, scoops, pokes, and bounces to form the majority of his normal, aerial, and smash attacks. Then you have his Relics (Flare Wand, Phase Locket, Dust Knuckles, Throwing Anchor, Alchemy Coin, Mobile Gear, War Horn, Propeller Dagger, Fishing Rod, Chaos Sphere, and Troupple Chalice) to possibly fulfill his specials, with any leftover perhaps forming a part of the aforementioned normal, aerial, and smash attacks. It’s certainly a plausible choice, but whether the big N decides to use an indie-creation or not is an interesting thought that could motivate and delight the thousands of indie-developers out there. Never has the possible Smash caption of “Shovel Knight paves the way!” applied so much here. To be fair, Krystal is the probable next-in-line character from the Star Fox franchise, despite her being the most recently recruited member of the Star Fox team. She’s appeared in several titles since her 2002 debut in Star Fox Adventures, one of which being 2005’s Star Fox: Assault – a game that was co-developed by Nintendo and Namco. Does that pairing ring a bell? Well it should, as Super Smash Bros. 4 was developed by the duo too. In addition, Star Fox: Assault had some representation in Wii U’s version of Smash 4 in the form of the Orbital Gate Assault stage. 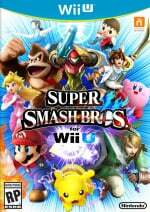 Furthermore, Smash Bros. creator Masahiro Sakurai has seemingly expressed interest in her via the form of a trophy and several secret Star Fox taunt entries in Super Smash Bros. Brawl (one even stating that out of her, Peppy, and Slippy, she’d be “the only one who can come through in a fight like this”). As for her moves and attacks, they’d likely revolve around her staff from Star Fox Adventures, consisting of physical, special, and projectile attacks, as well as her grenades and dual-wielding blasters from Star Fox: Assault. Her Final Smash could be similar to that of Fox and Falco’s in terms of summoning her signature starfighter, the Cloud Runner – or perhaps even riding on the back of what this spacecraft was inspired by: the pterodactyl-like specie known as the CloudRunner (yes it's called exactly the same thing as her vehicle, except with no space between the two words). Splatting in at number one comes another fairly new Nintendo IP, that being the Inklings from 2015’s Splatoon. This writer predicted that the squid beings would make the top three spot, and there’s plenty that justifies their immense popularity. The Inklings have a large range of weapons at their disposal, from paint guns, to paint rollers, to paint grenades, and couple this with their ability to transform into a squid and traverse through terrain covered with their own ink, there’s so much fun that could be had with this mechanic in the realms of Smash Bros. What also makes them so different is their non-physical approach – we never see the Inklings punch or kick, so unless Nintendo decides to turn them into maulers (it hasn't stopped them before - *ahem* Villager), they’d likely purely serve as a weapon-based fighter. Speaking of getting physical, perhaps their only physical/melee-esque move would be their Final Smash, which could be the almighty Kraken. In terms of costumes, this one’s an easy one; adopt a similar approach with Robin, Corrin, Wii Fit Trainer etc. and include male and female options, with different skin colours and clothing styles. And just like what was said earlier about ARMS, it’s another great way to promote the Splatoon brand to those who have yet to discover Nintendo’s revolutionary shooter – especially with its sequel, Splatoon 2, on Nintendo Switch. Of course, Nintendo already did this by including them as playable racers in Mario Kart 8 Deluxe, but there’s no reason to stop them from entering the almighty brawling experience that Smash Bros. has to offer. And there you have it! What’s your take on these revealed results? Did your favourite make the top ten? What movesets would you give to these characters? As always, comment with all your thoughts in the usual spot! I voted Sora myself, but I have to say several people on the list I don't really know at all. Awesome, I was waiting for this. Nicely presented NL, and some nice points about each fighter! Happy to see my pick placed 4th, didn't think it would make the top ten at all! Inklings are definitely coming to smash sometime in the future. They're a perfect choice it makes me excited just thinking about it!!! I wonder what place Daisy came in. Probably 10th-15th if I would guess, but thankfully it is not representative of everyone. As for the Inklings, screw them! Nintendo have a very bad tendency to put all of their focus on those characters ever since Splatoon became the #1 Wii U game in Japan...probably due to underaged reasons! I mean, version 3.0 added new character icons to the Switch, and they were all different Inklings! UGH! Inklings will come, they are from a Nntendo game that's really popular and they even came to Mario Kart. Then maybe an ARMS fighter. Also some that are possible is Shovel Knight or Bomberman. Others I would doubt would even come. ARMS & Splatoon are inevitably getting a Smash tourney invite at some point.... as for the others, keep wishing! Inklings are a guaranteed cert for the next game. ARMS, Sora, Bomberman, Simon Belmont, Shantae and Shovel Knight don't deserve a place. Inklings and Waluigi are the only 2 that should make it from the top 10. Anything from Square Enix should be ruled out straight away. That includes removing Cloud, he has no business being there. Anything Konami shouldn't be allowed either. I voted for Professor Layton myself. Sad not to see him among the list. Hoping to see him as a fighter one day. SSB needs a gentleman! Krystal? Seriously? At least she wouldn't be another Fox clone like Falco and Wolf. The fact that Geno isn't on this fake list is a crying shame. Aside from Krystal, who I'm surprised even made it on this list let alone second place, I otherwise agree with this. "Before finalising this article, Krystal actually secured first place by a great margin. However, after a bit of digging around, we found out that some cunning voters (mostly those not signed into the site!) were so passionate about the character that they tried to pull a fast one and "rig" their votes - cheeky! Nevertheless, as this writer already wrote-up Krystal's analysis (and made her graphic), we thought we'd keep it in here before revealing the poll's true number one!" Hahaha, I see. Every time I see her on a Smash Bros wanted list I rage so I stopped read. I'm of the mindset that to be included in SSB, a character should either be an important and influential mainstay of Nintendo and/or one who had a significant impact on gaming history. I'm a bit confused by the number of people who, when given options from the breadth of gaming history, would choose Shovel Knight, Shantae, or an ARMS character. I got left out AGAIN?!? @BacktoNarnia I think an ARMS character is a lock given its fighting nature, but it is way too soon for one to be considered for a Smash game or enhanced port. We'll have to see how it does in sales to guage its popularity. I'm with you also on the Shovel Knight character. He makes a nice amiibo, but I never understood why so many people want him in Smash, when, like you said, there are so many other characters out there that are more deserving. Shantae deserve and more a best position since that wayforward support very much the Nintendo handheld consoles and now with the Switch, with a game that also appeared (and was only with) in Wii U when this console, many people lost interest, but was a promise well fullfilled. I'm not so sure...that mindset, applied too strictly, could have cost us Ness, the Ice Climbers (who did have significant impact on gaming history, but only AFTER they were tapped for Melee), the Wii Fit Trainer, and maybe even Palutena (I love Uprising as much as anybody, but 20 years between games does not a mainstay make). Also, I don't suppose we could get to see the complete results for the poll, could we? "...but Krystal won the popular vote!" I would've gone with Isaac from Golden Sun. @SLIGEACH_EIRE I'd say Inklings and ARMS is a pretty safe bet. But Shovel Knight doesn't deserve a spot? THEMS ARE FIGHTIN' WORDS. I'm a little more indifferent towards bomberman, but I think he would fit in well with the style of the game, at least. @CC13 All good points. Wii Fit Trainer would probably still fall under my description because she represents the impact of casual gaming and the Wii era, though if I could go back and change Sakurai's mind about anything, she would be the first character I'd cut. Palutena too, though I think she was included because of Sakurai's connections to Kid Icarus Uprising. Krystal votes were most likely weirdos who like the animal cartoon character a bit too much. The top 5 though are all very welcome for Smash in my book. Sadly I've never got to play Kingdom Hearts since it's mostly a Sony thing despite loving Disney, but still cool. @BacktoNarnia I don't see how Shantae should be ruled out given that she started out on Ninty handhelds(GBC, DS, 3DS, and now Switch) and, up til just recently, pretty much is a mainstay with Nintendo. She is also another character that definitely wouldn't be a clone, which is already enough of a problem. @Lalivero Yes, but she still reflects a series of moderate success (both commercially and critically) that hasn't really changed the industry. I think she'd make an interesting and unique fighter, but there are just so many much more significant characters I would choose first. I think of Minecraft Steve or Rayman, for example, who would also be really unique fighters, have had a huge impact on gaming, have a presence on Nintendo platforms, and who will still be talked about and remembered a decade from now. it was a sad day to not see Phoenix Wright as an option. Sigh, no Rayman in the top 10. Instead a few other choices from me would of been. Bring back Ice Climbers and Wolf. Newcomers: K. Rool, Inkling, Arms Fighter (have it like Bowser Jr where you can be any one of the fighters in game by changing costume but have them all control the same), Isaac (Golden Sun), and Bomberman. There are others I'd certainly like to see, say Mike Jones of Star Tropics getting some love, but he doesn't seem that unique of a character and Nintendo seems to have completely forgotten that franchise at this point. Less reasonable: Banjo & Kazooie. As well as Young Link as a transforming character between Deku Link, Goron Link, and Zora Link (Fierce Deity being final smash), I don't think its likely for transforming characters to return, but I'd love for Young Link to be a character in this way if it did. Inklings are almost a certainty for a future Smash title. The related levels should be a lot of fun too. HOW AM I NOT ON THIS LIST!!?? @Biff_ARMStrong We have our Arms character people! It counts! @Biff_ARMStrong We have no idea what your moves would be, aside from using your head as a fist. @WaveBoy Although my first nintendo console was an NES to show my age my picks would be. Skull Kid: I've never finished MM due to a certain boss in the (Zora?) Dungeon, and I refuse to spoil myself, so IDK too much about him yet, but in all, from what I know about him, his powers aren't too...unique compared to a lot of the other characters listed here. I'd probably put him as #11 on my list. ARMS character: It would probs be Twintelle if one makes it. Not much more I can say though, due to not owning a Switch yet. Shovel Knight: I would love this. He would be in my Top 5 I'd say. Inklings: ...Meh. Sure, but I'd rather have most of the other characters on this list. @BacktoNarnia Hey, I'm just saying she relates to the matter more so than a number of clones and other choices is all; I get your point though. Personally, I feel the history on a Nintendo system/more of a history with Nintendo should be ahead of just being a significant character, seeing as it is a Nintendo game, so I'd put her above the likes of Steve, though I'll say I'm definitely puzzled that Rayman hasn't made it into the game yet over some others and agree on him. Inkling was the real winner, and with good reason. The rest of the picks aren't too bad either. @duffmmann Well, I'm an expert at volleyball and I can slam dunk among the best of the them. That's a start. Also, if Smash Bros. needs a commentator during the offseason...I'm their guy! Thoroughly enjoyed this article! More votes for Chandler next time people! Inklings and probably that spring man and ribbon girl from ARMS look nailed on. Shovel Knight would make my decade. Bomberman and Rayman are such obviously logical choices it makes me want to scream! I believe in the power of Woomy! @PlywoodStick Hmmm, yet you're the first one to talk about the character being a pin up......perhaps there's something you'd like to share with the class? Bomberman has been on as many Nintendo consoles as Mario has. That is to say... all of them. And he has more mainline games across every Nintendo platform than Mario has, too... Bomberman was even on the Virtual Boy! Why wouldn't he be in Smash? Shovel Knight, the Inklings, and the ARMS fighters are spring chickens, they shouldn't get dibs over Bomberman. Sora has been on Nintendo platforms since the GBA, but Bomberman has been around since the NES! No other third party character has as much experience as Bomberman does on Nintendo platforms. It's mind boggling that he's not in Smash already. I'd be cool with any of the others, though. K. Rool is probably my favorite. Article is wrong. Krystal's last appearance was in 2006's Star Fox Command. That was actually a good game. A sort of under-aiming Star Fox game, but a good DS game. Like Adventures. It wasn't me! I'm innocent! That just randomly appeared somehow! @NintyNate And 3DS. Dream Drop Distance. @PlywoodStick But then to be fair, it needs to have Bombergirl, with exploding clothing. It's the future of Konami! @NEStalgia Hey, exploding clothing is a great invention! It used to be with the old bomb suits that they couldn't be taken off easily, leading to many severe burn victims succumbing to their wounds. BUT NOW! They can burn off right away while taking the hit! The Bomberwomen are not girls, they are innovators and saviors. There's nothing wrong with their clothing burning off! Clicked baited into thinking it was the official Smash Ballot. @BacktoNarnia i agree with you 100%. I view the Smash roster as a Hall of Fame of gaming. From that perspective, (not that everyone needs to agree with it), ARMS, Shantae, Shovel Knight, Inklings (yet), and definitely Krystal don't belong, even though I think they'd have some interesting move sets. Simon Belmont definitely belongs. He's half of the Metroidvania genre. Bomberman, Sora, Waluigi (arguably), and Skull Kid are all iconic characters from classic games that at least deserve a second look. I could even add more to the conversation like Earthworm Jim, Ryu Hyabusa, any of the Battletoads (if they weren't already in Killer Instinct), or even Popeye. @EmmatheBest Konami owns Bomberman, not Bandai. Speaking of which, glad to see him in the top 10! Dr. Wily really could be a very nice choice (especially now that Mega Man FINALLY made it into smash). I'm actually surprised he wasn't on the list. Moveset might be a bit tricky, but I guess it could be done using some Wily machines and of course his iconic flying saucer. I was about to rant why Inklings weren't in the list, then I read a bit more, and... "Oh. Good." @duffmmann idk, Young Link having two Deku Link transformations seems excessive, why not just have Zora Link instead of the second Deku? I want a guardian, lynel, thunderblight ganon or Urbosa herself. I totes forgot about Sora in my post where I talked about everyone else for some reason. I'd love if he got in it too, TBH. Definitely deserves it more than say Inklings or an ARMS character, at least. @SLIGEACH_EIRE If they can create some unique and decent fighters from Konami or Square Enix characters, why not? @roadrunner343 One indie game and you get a spot in Smash Bros.? I don't think so. There are major 3rd party characters that have been around decades that are far more deserving of a place. I just thought of Rayman. How wasn't he included? Ubisoft do more for Nintendo than most Japanese developers. @UmbreonsPapa The latest story on the site is why Konami don't deserve a slot. The same goes for Squenix. @SLIGEACH_EIRE I'm assuming you picked up on it, but obviously there was a degree of sarcasm in my post. I would love for Shovel Knight to show up, but I'm not offended if he doesn't. Though saying a character has to be "deserving" of a place in Smash is a bit goofy. The only requirement should be, do people want a specific character? Rayman would also be interesting. I think both characters would fit well in Smash. Waluigi should be an Arms character with those appendages. Shovel Knight, Arms fighter, Inkling...those make a lot of sense. Sora? Krystal? Bomberman? Bleh. Maybe it's cause I've never been into Bomberman, but I don't get why people want him so badly. Me, I want Snake back...And Dark Samus. We need Dark Samus! @memoryman3 Are you suuuuure you don't want Daisy in for...chuckles underaged reasons? I want Shovel Knight so much. Not just because I love his game but because his moveset would easily become my favorite in terms of functionality. At least the way I envision his moves working. Wasn't expecting Sora at all,let alone him being in the top five. I'm also hoping Arc System Works makes the next Smash, as they clearly have a lot of passion for their work, their games look beautiful, and they actually take the time to design move sets around source material as is shown in Dragon Ball FighterZ. Where is Geno? Fake news! So, where are the people who slammed Corrin and the Fire Emblem reps for stealing spots in Smash 4 from King K. Rool and Ridely, who they claimed everyone one wanted? Because I saw King K. Rool get 10th place and Ridley not even show up. Maybe Fire Emblem got some many reps because people like the characters that come from large diverse casts? Fire Emblem Heroes alone should prove that. Still want @Alex_Olney for Smash. His final smash could be "Do something to that subscribe button", and his smash attack could be "Hello there, lovely people". Then the other attacks could be made up from knocking the camera, summoning his girlfriend (whose name I can't remember. Sorry) and Arrekz Gaming, and pouring good gravy biscuits on his enemy. I almost thought Krystal was legitimate and lost any hope for the human race for a moment. Shovel Knight and Sora appearing on there were soul crushing enough. I'm surprised I don't see very many new IPs from Nintendo, like Rusty's Real Deal Baseball, Snipperclips, Box Boy, or the Rabbit from Nintendo Badge Arcade, or Monita from Nintendo Land. Also, I'd like to see Captain Video or Dave. No Sylux or Weavel in the top 10 is kinda disappointing, Smash needs more non-Samus Metroid reps! @memoryman3 Daisy in 10-15 if you were to guess? Keep dreaming, I'd be surprised if she even got in the top 20. 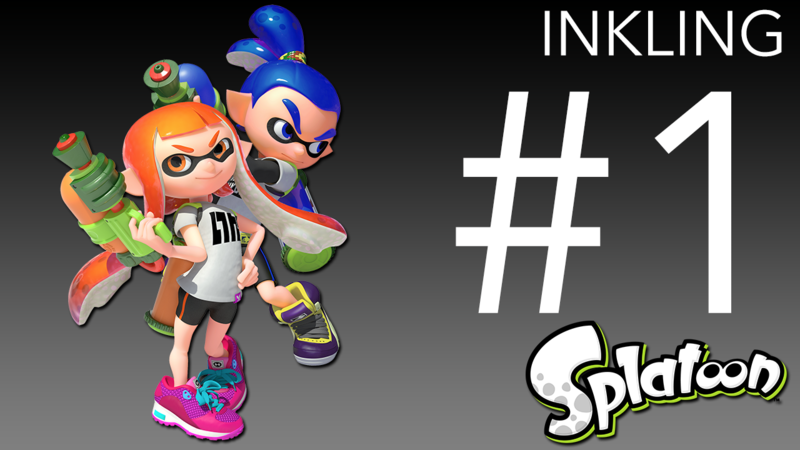 Inklings where the right choice, because they more popular. Simon Belmont (or any Castlevania character) needs to be in Smash. Inklings, Waluigi, and Spring Man with Ribbon girl alt skin should be garuanteed. Anything else, meh. If the next Smash is a port of 4 then don't expect any radical characters especially anything from Square Enix. I think a long asked for mainline Nintendo character such as Waluigi and a character from one of Nintendo's recent IPs should be represented to make people interested in buying. Personally I just want a grass starter Pokemon in the next smash. Feels weird having Charizard and Greninja but no grass counterpart for them. I'm...honestly surprised about the top choices. Thank goodness Bomberman made the top 5. My faith in mankind has been restored. YOU GUYS ROCK! Sad Simon Belmont wasn't higher up! @David_Dudeney dude... why are you not working on the Smash team. Wow, the Krystal hate is real on this sight. I didn't know she was so unpopular. I haven't seen so much bashing since Waluigi's introduction. I'm happy to see Shantae make the list. She's an indie character who actually has a solid history of games. Also happy for K. Rool and Inkling. My biggest gripe is Sora: I like him just fine, but any appearance from Kingdom Hearts would feel empty to me without Donald and Goofy, who aren't allowed in Smash. Go watch my smash bros switch trailer on YouTube @ Smash Guy 52 to see a cinematic trailer with newcomers such as Inklings, Ridley, and Spring Man. What about JoeysWorldTour or Gabe Newell? All I wanted for Sm4sh was Ridley, Shulk, an FE mage, and Sports Waifu Daisy. Still waiting on Ridley and Sports Waifu Daisy. @Alto Maybe we could make a fan made rip-off of Smash, but only using people from Nintendo Life, so that Nintendo doesn't take it down. Then we can get hired by Nintendo, and put them into the game. Free focus group data from your core audience, Nintendo. We need more love for Ryu Hayabusa. Ninja Gaiden is one of the top 10 greatest NES games of all time. Not to mention that Ninty has a good working relationship with Koei Tecmo right now. Really, Krystal. Who would've thunk it?! I can certainly get behind Chandler Bing. It makes no less sense than the Wii Fit Trainer. No, really, I'd like to see him in Smash but of course he won't. Out of those ten, I think Bomberman and Simon deserve to be in Smash due to their history and presence on Nintendo consoles, though I wouldn't want them myself. 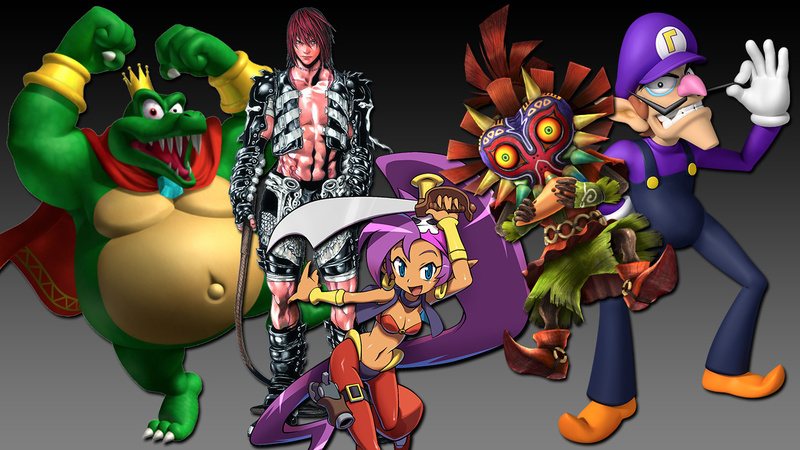 Actually, I think the only one I strongly want to be in Smash is Skull Kid, cause I just love the character. King K. Rool would be fine due to a lack of villains and heavyweight characters, but I'm not sure how his moveset would work. Shantae would be interesting, as she's been on Nintendo consoles since the beginning and has been esclusive for a while; on the other hand, she's the star of a "minor", indie franchise. Waluigi wouldn't interest me personally, and I think he'd mean Mario characters overkill. Inklings and ARMS characters are bound to be in sooner or later; neither excites me personally, but they'd make obvious sense, being new Nintendo IP's in a game that brings Nintendo IP's together. Finally, Shovel Knight: as much as I like the game, I'm not sure he'd be a great fit. His moveset would be interesting for sure, but he's only had one game and an indie one at that, meaning he doesn't have that rich of a history. Conker the Squirrel would be perfect for this game. Yeah Krystal is a surprise, but without all the cheat votes I doubt she would be as high. She's actually pretty low on my list of Star Fox characters to include. Peppy or Slippy would be next and wouldn't simply be a reskin of Fox/Falco/Wolf like Krystal would be. As always, I'd like to see a character from Golden Sun one day. Isaac/Felix most likely, but seeing as the assist trophy was dropped from Smash 4 I think we're talking to a brick wall. Would rather see a brand new game but...yeah. Kristal? Friggin sora? You make me sick People. @SLIGEACH_EIRE I don't get how sound business decisions mean Nintendo shouldn't consider their characters for Smash. It isn't like they are dismissing the Switch for good. They are taking a wait and see approach, which makes a ton of sense. I am glad to see that Bomberman made the Top 10. Here is to hoping that he makes it into the next Smash game. I would buy it if he gets in. @greengecko007 The difference in this case is that Sony and Microsoft characters are nearly impossible to add in Smash for legal reasons since Sony and Microsoft are in competition with Nintendo. Third-party characters can appear on any platform. As long as a character appears on a Nintendo platform once, they can be in Smash (providing both parties allow this to happen). @caryslan Lucina, Robin and Corrin were not included due to being popular or fan demanded characters. Only Roy was included due to popular demand as DLC. Outside of Mega Man, DLC veterans and Bayonetta, I doubt any SSB4 characters were added because of the fans. @memoryman3 I don't mind the Inklings, but I 100% am in favor of Daisy being a real, actual character in the game. I think Nintendo needs to use her more. A strong female character who already exists (and wasn't created just to be "a strong female character" for sales' sake) and such a contrast to Peach. She could be a speed character more than Peach is, with a distinct moveset and maybe not the average Peach Fluffy Dress-but-in-a different color. Give her the Mario Strikers outfit or something and make her UNIQUE. That is my biggest wish for both Smash Brothers and the Mushroom Kingdom cannon going forward. Daisy deserves to be out of the Peach shadow like Luigi has out of Mario's! Honestly, while these choices are pretty cool, I can't hep but want to see characters like Rayman make the cut for a Smash game. His moveset is already good to go like the moves of Origins and Legends and people have been wanting to see him as a fighter for years. That trophy was amazing in Smash 4 but it feels like a cop-out. I really want him in alongside other characters. @memoryman3 I love your obsession with Daisy, you seem like a very passionate fan. Sora would have been so much more appropriate than Cloud. Neither were really appropriate considering how much SE snubs Nintendo, but Sora has multiple appearances. When has Cloud been in a game on a Nintendo console? As a card in Kingdom Hearts Chain of Memories? Maybe in that Theatrhythm game (I never played it, so I don't know)? Cloud's appearance in SSB4 is such an oddity. It bothers me to this day. I'm fine with third party character inclusion, but at least try to pick third party characters who regularly appear on Nintendo systems and from companies that try to respect Nintendo. Otherwise, there's a wealthy pool of first party characters that we all want to pick from, and the fact that Cloud was chosen over any of these really doesn't sit well with me. @Harmonie Honestly, neither Sora nor Cloud deserved to get in. If we wanted to base the Square Enix rep on ties to Nintendo hardware, then it should have been someone from Dragon Quest. Nobody can argue that Dragon Quest has found a home on Nintendo platforms, as the remakes, IX, X, and XI prove without a doubt, alongside the countless spin-offs. Dragon Quest should have been the Square Enix rep. But sadly, its niche status outside Japan dooms it compared to Final Fantasy and Kingdom Hearts. And the fact is, Cloud prints money. I read that Japan wanted Cecil as the Final Fantasy rep, but Cloud was picked due to his larger, mainstream popularity. Nice to see that King Rool is in it! You guys have worse taste in characters than Sakurai himself. I voted for Krystal, once. I didn't know there was such a dedicated fanbase for her. It was just the obvious choice. Mario, Zelda, Pokémon and Fire Emblem already have enough characters. She's a Star Fox character, of those we have only 2 (3 if we count Wolf who wasn't in Smash 4 unfortunately). 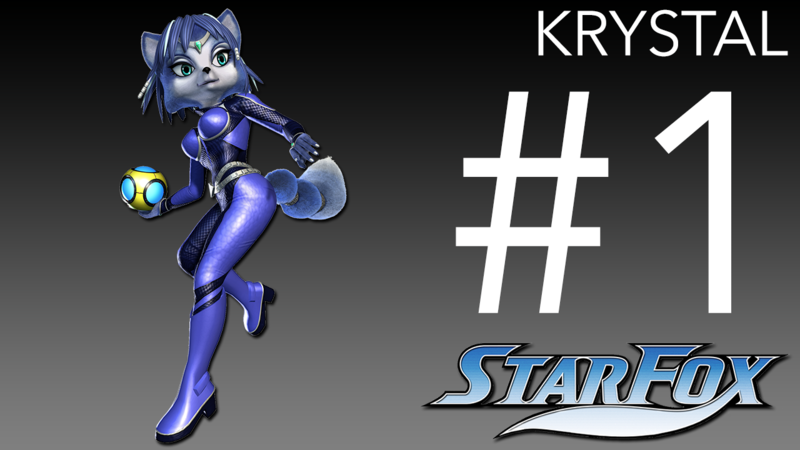 At the time (before Starfox Zero) it seemed Krystal had been turned into a main character, and not a only debuting in Starfox Adventures, but taking over main roles in Stafox Command and Starfox Assault as well. However, I think the next Smash will get an Inkling and one or two ARMS fighters with much obviousauce. From the characters above, Sora is the only one I don't like, but I never played Kingdom Hearts and the character looks boring. Shantae has been on Nintendo platforms for a long time, and, stylistically, she's a perfect match for this game. She's the only addition I really care about. @Dakt My thoughts exactly. Goemon would fit so perfectly in every single way.